Ignatius Perrish spent the night drunk and doing terrible things. He woke up the next morning with a thunderous hangover, a raging headache, and a pair of horns growing from his temples. At first Ig thought the horns were a hallucination, the product of a mind damaged by rage and grief. He had spent the last year in a lonely, private purgatory, following the death of his beloved, Merrin Williams, who was raped and murdered under inexplicable circumstances. A mental breakdown would have been the most natural thing in the world. But there was nothing natural about the horns, which were all too real.Once the righteous Ig had enjoyed the life of the blessed: born into privilege, the second son of a renowned musician and younger brother of a rising late-night TV star, he had security, wealth, and a place in his community. Ig had it all, and more—he had Merrin and a love founded on shared daydreams, mutual daring, and unlikely midsummer magic. But Merrin’s death damned all that. The only suspect in the crime, Ig was never charged or tried. And he was never cleared. In the court of public opinion in Gideon, New Hampshire, Ig is and always will be guilty because his rich and connected parents pulled strings to make the investigation go away. Nothing Ig can do, nothing he can say, matters. Everyone, it seems, including God, has abandoned him. Everyone, that is, but the devil inside.Now Ig is possessed of a terrible new power to go with his terrible new look—a macabre talent he intends to use to find the monster who killed Merrin and destroyed his life. Being good and praying for the best got him nowhere. It’s time for a little revenge. It’s time the devil had his due (Source: Goodreads). I’m really glad I picked this up. Horror isn’t really my thing, or at least it hasn’t been. Lately I’ve been delving into Stephen King, and I think the fact that I loved this book so much had a lot to do with that. 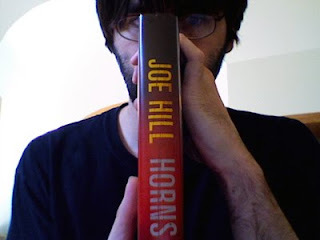 I’ve been hearing a lot about Joe Hill lately because a few of my Goodreads friends recently formed a group to talk about his books. They invited me to it and I just though “eh. 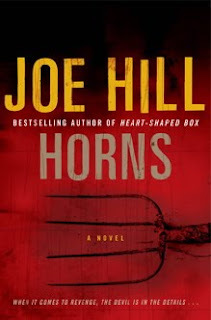 thanks but no thanks.” Then one day I clicked the link to read the summary of Horns and thought “hey, cool cover!” Which, of course, being of the “ooo, shiny and pretty! must have it!” club, made me add it to my TBR. I picked it up and was immediately (and I mean from the first paragraph) hooked. One of the major plot questions is answered fairly early on, and let me tell you…that didn’t slow down the pace of the story at all and usually that kind of thing bugs me. Since I knew the who…I wanted to know the why, and I raced through the book to find out. Along the way, I became more intimately aquainted with one chilling dude, and fell in love with Marrin. She was a peach. Ig, I’m sort of iffy about. He was a very interesting character to read about, don’t get me wrong. I don’t know if I’ve ever come across such a tortured character. Its just one of the first books I’ve read where the main character is more of a lesser of two evils then a good guy. It was interesting, I enjoyed the different perspective. This baby has layers. Every time I got a little thrill from figuring something out, he would peel back another layer that would leave me filled with as many questions as ever. He never lets you get comfortable or quit guessing. I’m sure a lot of people were put off by the constant changes of time, place and perspective. Not me. I thought it kept things interesting. I’m a big fan of the way he paced and organized everything. So anyway, even if you don’t think you’re a horror fan…give this a shot. Anybody who enjoys the unraveling of a complex mystery and a layered story should easily fall in love with this one.